So Star Wars and Twilight have something in common? 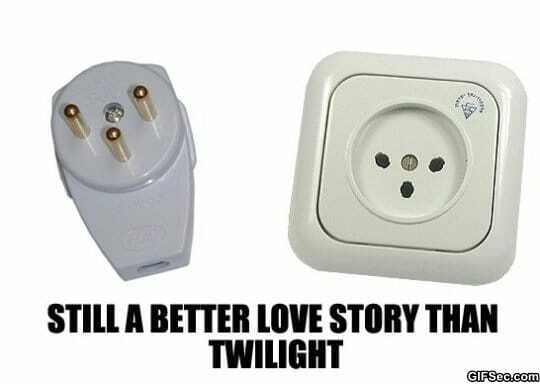 Everything is a better love story then twilight. You should expect those sort of things from Equi. It was a little boys birthday. "What is your birthday wish, son?" The father asked. "I want to shower with mommy and daddy!" The boy said. The parents looked at each other, then back at their son. "We'll shower seperately with you, but not together." The mother said. The next day, the boy took a shower with his mom. "Mommy, what are those?" He asked, pointing to her chest. "Those are my headlights!" She said. "And that?" He pointed to her thighs. "That's a bush!" She answered. The next day, the boy showered with his dad. "Daddy what's that?" He pointed to his thighs. "That's my snake!" The dad said. That night, the boy went into his parents room to say goodnight. He opened the door, then screamed "MOMMY! TURN YOUR HEADLIGHTS ON, THERE'S A SNAKE IN YOUR BUSH!"